When you add products to an order form you have a number of options available. You can set a free trial period, sell the product as a recurring subscription, offer an optional payment plan, allow your buyers to increase the quantities, set physical product fulfillment options, offer coupon codes or charge the order on a later date. The options below are available after you add an order form to your ONTRAform or ONTRApage, click the payment settings link and add/edit a product on the order form. See this article on how to add order form blocks in ONTRAforms and this article on how to add products to your order form. To offer a product with a trial period (e.g., 1 week for $9.99 and $197 thereafter) adjust the settings. To remove this item, hover right and select remove trial period. To offer a product with a continuous, recurring payments (e.g., $97 per month), adjust these settings. To remove this item, hover right and select remove subscription. To offer payment plans (e.g., one payment of $497 or 3 payments of $199 per month), adjust these settings. To remove this item, hover right and select remove payment plan. Tip: Offer multiple payment plans by clicking the + Add payment option link in the product grid. To allow customers to change quantities of items on the order form. select this option. 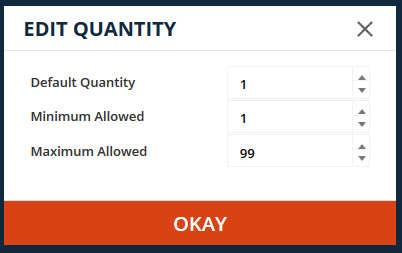 Enter the default quantity, minimum and maximum allowed per order. This option is NOT available on Upsell Forms. Note: If you set the minimum quantity to zero, ensure that your Campaign Trigger/Goal has a condition "Has ordered a certain number of a product" to ensure you're only delivering product to actual buyers. Once complete, the product grid will have an up/down arrow next to the quantity of the item so customers can tick the arrows up or down. 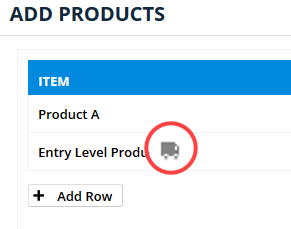 To remove this item, hover right and select remove editable quantities. For products that need to be shipped, select this option. Once complete, the product will show a small truck icon next to it in the product grid. To remove this item, hover right and select remove from shipping/packing slip. To enable customers to enter a Coupon Code for a discount, select this option. Once complete, the product grid will show a row for Coupon Code. To remove this item, hover right and select remove Coupon Code. This option is NOT available on Upsell Forms. To charge all items on the order form on a later date, hover over the "Total" column at the bottom of the grid and enter the date you'd like all charges to go through on. To remove this item, hover right and select remove charge on later date.